I'm Steph - new to the forum and cycling generally. I am in the process of finding myself a cargo tricycle for the purposes of transporting my kids around (3 of them ages 2-6) as an alternative to the car in the inner city. I was wondering if anyone knows where/how I can test ride one? Or possibly if there's an alternative for transporting 3 kids I should be thinking about? I know of one person in Sydney who has an electrified one and uses it for carrying children. They do make a "Big" model that fits 6 children. The "big" model might be a bit big for me to push around... but I think some googling may be in order, thankyou I didn't know about it! I have looked into cargo bikes of this ilk myself. Bakfiets seem to be one of the better brands with better steering and a stiffer chassis. They seem pricy though. Hmm, thinking again about this, if you want a tricycle, and you need to carry three, maybe you could put the two smallest in the trike, and put the bigger one on a tag-a-long. Jon, how do the extra cycles go with carrying school bags and things like that? I'm a little worried that my younger two (2 and 4) aren't old enough to hold on and that we'd only fit one seat on there? Colin, I was thinking about that option with a tag-a-long. Would the tricycles/dedicated cargo bikes work with a tag along? I was thinking I would probably need electric assist since we're in a hilly area- would that complicate things? With the tagalong, once I drop the tagging-kid off at school, I'd just be able to ride home with it empty? Thankyou so much for taking the time to help me- I really appreciate it! You can ride a tag a long while it's empty - its no different to riding it with a person on it (except lighter of course). And they're quick and easy to take on and off - so you can leave it at school all day if you like. Just another thought, you could put a child seat on the back of your bike, and then put the other two (with bags) in a trailer. My understanding of tadpole trikes (two wheels at front) it that their rear end is pretty much standard, so should work with any tag along, trailer, child seat etc that you like. bakfiest have their electric motors on the front wheel(s?) which has lead to many questions about torque steer, which I haven't found answered anywhere on the net as yet. I think the only thing that affects your ability to mount things on your bike is the position of the batteries. Peter from PS bikes in Melbourne sells Christiania trikes. They can carry three children and are also very stable when stationary if you have a rear mounted child seat or tag-a-long and offer some of the better all weather canopy options plus the option of factory approved E-assist. Their steering is widely considered inferior to Nihola but comparable to the Dutch trikes. They come in aluminium so they are lighter than many trikes. This may seem trivial, but if you have to pedal up a hill after dropping the kids off or on your way to the supermarket it can be quite a bonus. PS bikes will deliver for a free test ride and also plan to set up shop in Sydney. Thanks so much for the tip, I'll definitely check them out- I have heard good reviews of the Christiania. Jon, your point about motorizing a tadpole trike is a really good one. 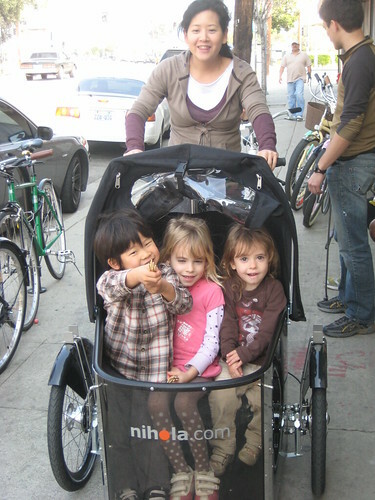 As an alternative, would it be possible to motorize a bakfiets cargo bicycle *and* put a larger childseat on the back to take three kids? I have been thinking of the trike due to stability and my not being an experienced rider- but if a few weeks of practise without kids gets me the skills I need and better handling, then perhaps that's an option to look at. Colin- thanks for the tip about the tagalong!